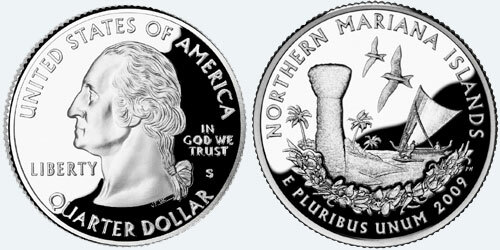 Back in May of last year, Guam residents were asked to vote for one of two Guam quarter designs and this is the design that garnered the most votes and went on to be minted. 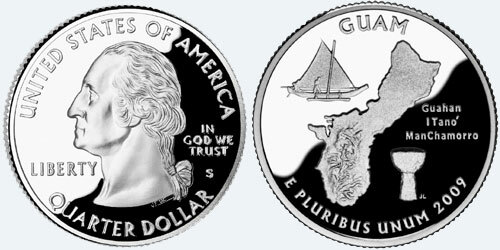 The Guam quarter is scheduled for release this year. I actually voted for the design that didn’t win. There’s nothing really wrong with the winning design, my only comment is that I think it would have maximized the use of space and probably would have looked nicer if the three elements were designed together instead of being three separate floating elements. I think the C.N.M.I. quarter, also releasing this year, did a good job of that. It’s very similar to the Guam design that I voted for. All that aside, I’m excited about both quarters and I’ll be collecting as many as I can find. I agree with you Josie. I liked the other quarter better (the one I also voted for). As much as the official quarter shows a lot of local pride, oftentimes these things are “mini-ambassadors.” The other design, with the really cool scenery and ocean background, would have probably raised more intrigue and make people want to google and learn more about the interesting looking place in their quarter. Instead we have to what a person who would not know anything about guam… “a boat, some island, and a strangely shaped stone.” Like I said, I as a local, think it’s cool, but I’m disappointed because it does not have the same “intrique factor” like the other. looks good. Collectors item for sure. OT: What ever happened to that magazine we took those surveys through out email for? Did it get published? Saipan in the Northern Mariana Islands? You know, the place on the quarter.